I help leaders adapt, respond, and prosper in complex business environments. Business leaders and entrepreneurs often seek out “think tank” opportunities with Sharon. Here’s a fast and easy way to get her undivided attention focused on whatever is going on in your business or your life. If you’re ready to take the next step toward accelerated performance and profitability, schedule your strategy session today! If you’re at a crossroads in life, and you need help determining your next steps, Integral Coaching™ is for you. As a certified Integral Professional Coach, I will help you build upon existing strengths and capabilities so that you can tackle what’s next. The process is customized to meet your unique needs so that you can achieve measurable outcomes—all in support of your biggest dreams and desires. Today’s leaders are constantly faced with a barrage of choices as they face the daily challenges of rapid change. It’s important to make sure that your people are fully aligned with a culture that supports a clear strategic vision for the organization. My research-based sessions are designed to help you and your team discover existing strengths and weakness so that your business can gain a competitive edge in a global economy. If you want systemic change in your business, you’ll want to take advantage of my workshops, seminars, and keynotes—any one of which will catapult your team to higher levels of performance and profitability. What if everything you believe about time and money is sabotaging your success? Now Available! Get Your Copy Today! Is Gossip Destroying Your Business Culture? I help leaders adapt, respond, and prosper in complex business environments. As a business strategist, Certified Professional Integral Coach, speaker, and author, my job is to help you realign your business strategy with a culture of performance that also supports you in living your biggest life. I am also a scholar-practitioner who enjoys researching and understanding some of the hard stuff of life so you don’t have to. There’s nothing like helping people step into deeper levels of consciousness and understanding such that they come out more passionate and fulfilled on the other side. Whether you’re a person in the midst of change, an entrepreneur, or an organizational leader, I’d love to help you discover your next step and what it means to have a more meaningful and prosperous life. Is what you believe about time and money sabotaging your success? In this groundbreaking book, Dr. Sharon Spano unlocks the secret to a more profound way of utilizing your resources. 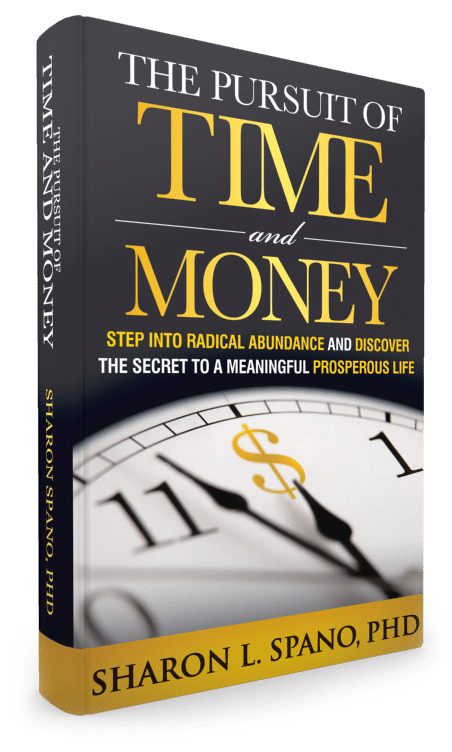 Learn how to transform your relationship with time and money so that you can step into a more meaningful and prosperous life. Download a Free Chapter Now!